You want to implement change in your organisation. Great! You already have an entire process ready, but how do you start rolling it out? Who do you include first? Or do you include everyone at the same time? Read these 3 tips to get to know how you should implement change in your organisation. We've implemented over 100 performance management systems, and we found that the best way to implement any kind of change in an organisation is to roll-out in batches. You don't want to include everyone from the start and at the same time because you will have to deal with more resistance than if you start with small groups. Start with the people that are open to change and have a high impact. This group will have a significant influence on all others in the organisation. Make sure these people understand what the vision is, where you want to move towards and that they’re doing it for the right non-political reasons. Then, add people that have a low impact but are very open to change. In the third phase, you expand your project group even more with a large number of people. They have a low impact on others in the company, but since this third group isn’t ready for change you need to persuade them with examples and success stories. So as HR, you should kindly oblige the involuntary group to change but also show them the benefits. The fourth group is the most challenging group. There is a high risk that they won’t accept the change, that’s why we include them as last. If you follow this model and add them at the end, your success rate will go way up. They have already seen the advantages from the three previous groups, which gives them enough evidence to go along with it. Focus on leadership, why you want to change and how this will benefit your organisation. The ultimate scenario would be that everyone in your organisation agrees to all the changes you propose. However, that's never going to be the reality. People are naturally opposed to change, so you will always have to deal with resistance. Is it mission impossible to get people accustomed to a new process that differs from what they have been used to for the last 10 years? Not at all. The key word here is communication! You need to communicate why you are making changes, how this will benefit them and show proof with success stories. People tend to agree on something once they have evidence from someone else. Don't expect your first roll-out process to immediately be the perfect one. Every time you add a group to the process, you should evaluate if the process is right for your organisation or if you should include some alterations. Maybe you will realise that some processes are too advanced, so you will want to focus on something else in the meantime. You can always re-include these processes at a later time when everyone is ready for them. 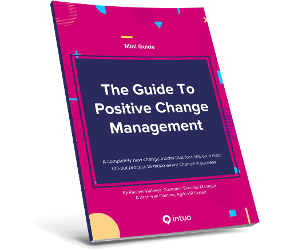 We wrote an entire Mini Guide on how to implement change in your organisation. Download it below!